SSAB and Sandvik are looking for ideas to create a unique fingerprint-like identifier that makes tracing of steel products like plate, strip and tube possible throughout the steel refining value chain all the way to the end product. The identifier needs to be an intrinsic part of the product even after cutting in pieces. Furthermore, it needs to withstand both thermal and mechanical processing (e.g. mechanical bending, deformation, shot blasting, high temperatures, painting, contact with acids and other chemicals). The Innovation Challenge is organized as part of the SmartSteel project related to the Strategic Innovation Program PiiA. Currently, tracing of steel products is possible via physical markings. The vision is to provide the opportunity to follow the steel products all the way from the mill to the end product, for example to communicate its properties and processing instructions to the processing machine. The first version of the SSAB SmartSteel service enables customers to identify products and access material information. Read more about the vision of SmartSteel at SSAB. We are seeking ideas in this innovation challenge from companies and research groups of all sizes. We are open to all proposals, from ambitious out-of-the-box ideas to more mature solutions. The ideas can be related, but not limited to: Metallurgy (material characteristic), IT (digital twin, artificial intelligence), Mechanics (metal production and refining), Chemistry (adding traceable material, chemical DNA), Marking, Sensing (measuring a unique identifier) etc. We are seeking long-term collaboration and partnerships. The winners will have a chance to pilot their solutions with SSAB and Sandvik Materials Technology, a business area within Sandvik Group. Depending on the technology maturity level and further development needs, joint R&D projects are also possible. Winners will have access to technology expertise, business knowledge and the international customer network of SSAB and Sandvik Materials Technology. The solution needs to work in a heavy industry environment. Product identifier may change during any stage, but changes need to be tracked. The product identifier should follow the pieces, even after slitting and cutting of the mother piece. Possible product identifier device should cost less than 10 k€ in the final form. Methods based on radioactive signatures will not be considered (safety and contamination issues). Method should not impose health hazards on humans and not harm the environment. The Innovation Challenge is organized by Spinverse in collaboration with SSAB, Sandvik Materials Technology and PiiA (Strategic Innovation Program for Process Industrial ICT Automation). Submit your proposal by 2 November 2018 by 23:00 (CET) through this link. Finalists will be selected by 12 November 2018. 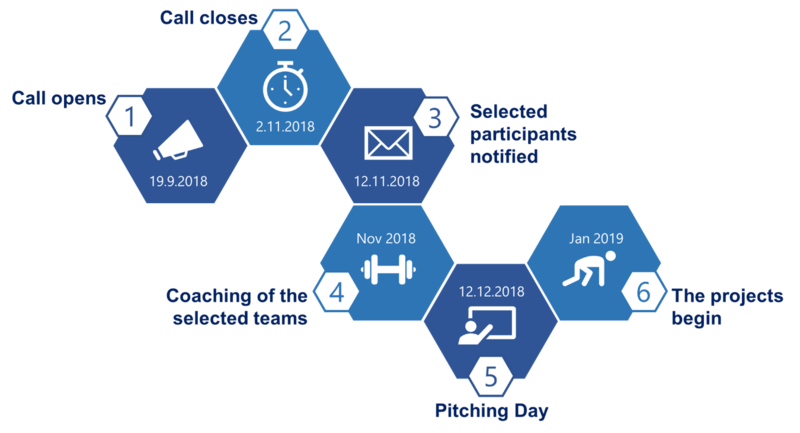 Coaching the teams, facilitated by Spinverse, will take place in November 2018. The finalists will individually present their ideas to SSAB, Sandvik Materials Technology and PiiA representatives at the Pitching Day in Stockholm, Sweden on 12 December 2018.